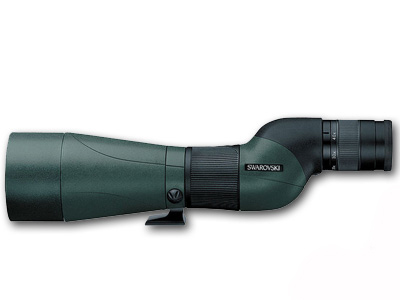 The STS-80 25-50x 80mm HD Spotting Scope with Eyepiece (Straight Viewing) from Swarovski is a rugged yet refined scope from one of the world's most renowned optics manufacturers. The STS series combines the unmatched image quality and world-class workmanship that nature enthusiasts, tactical professionals, and researchers have come to expect from Swarovski. The 80mm configuration is compact, relatively lightweight, and particularly well-suited for the hunter or birdwatcher on-the-go. Ergonomic handling and user-friendly functionality package the STS premium optics into a full-featured glassing system. An included 25-50x eyepiece features a wide viewing angle and generous eye relief, making the STS an observer's delight and nothing less than you expect from Swarovski. The eyepiece quickly attaches/detaches from the objective assembly's bayonet mount for easy disassembly, transportation, and storage. The nitrogen purged, o-ring sealed, and rubber armoured housing ensure waterproof, fogproof, and shockproof performance in almost any environment. Whether you are in the wild, on the battlefield, or at the range, the STS spotting scope is engineered to deliver world-class performance in extreme conditions for years to come.